THIS ARTICLE, LIKE ALL CONTENT ON THIS SITE, IS COPYRIGHT PROTECTED. IT MAY NOT BE REPLICATED WITHOUT MY WRITTEN PERMISSION. PLEASE DO LINK TO THIS PAGE INSTEAD. The engine: BMW’s S50 B32, fitted to the E36 M3 Evolution, and the Z3M roadster and coupe. A 3201cc inline six, in non-US specification with 6 throttle bodies, and 321 horsepower. A naturally inducted engine, with more than 100 horsepower per litre, and peak torque, all 258 lb/ft, available at only 3250rpm. Such a powerful yet flexible engine owed its broad spectrum of abilities to its variable lift and timing system, called VANOS. This is the silver unit on the front of the engine, and uses oil pressure to operate continuously variable camshaft profiles on both the inlet and exhaust cams. It’s great, when it works. The problem: The VANOS isn’t as tough as the rest of the engine. The exact problem is two-fold. One half of the problem, despite a good deal of research, still isn’t absolutely clear to me. I guess a combination of wear and tear, and perhaps design, causes the unit to rattle and growl as the engine falls from about 2000rpm to idle. I’ve heard that this can get so bad that the system stops working and requires a rebuild, but I’ve not actually known a system come to this. However, the other half of the problem became very real indeed recently. Perhaps aggrevated by the cause of the rattling and growling, the bolts that hold one of the VANOS covers on can suffer from vibration fractures that lead to bolt failure. The most usual cover to fail is that over the exhaust side solenoid valves. Having just started the car, while reversing, I was alerted to the thick trail of oil my car was leaving on the ground. I killed the engine, opened the bonnet, and was greeted by the image top right. Two of the four bolts holding on the exhaust side solenoid valves cover had sheared. The cover holds the solenoids in place, and with 100 bar of oil pressure on the other side, once the cover was loose the solenoids gave way and the engine lost oil at an extremely high rate – at idle! In my case I was fortunate: I imagine that if this occurs while the engine is at high rpm, oil is lost so fast that only immediate shut off can prevent a seized engine. Prevention and Repair: So long as the engine isn’t starved of oil, repair is possible for less than £25. Prevention is of course quicker, cheaper and less messy than the cure, so I’ll cover that first. I’ll outline the parts I feel should be changed at service Inspections. Of course upon acquiring one of these engines or first reading this, I’d advise you perform the Inspection II changes immediately. 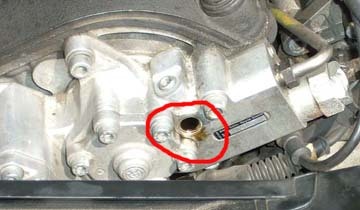 Identify the four bolts that hold on the exhaust side solenoid cover, as shown in the image top right. Standing at the front of the car looking at the engine, it’s on the left; you may need to remove a piece of fan cowling to gain proper access. Replace the bolts, one at a time, and use a torque wrench to tighten up to 8Nm. Do not have more than one bolt removed (or even loose) at any one time. 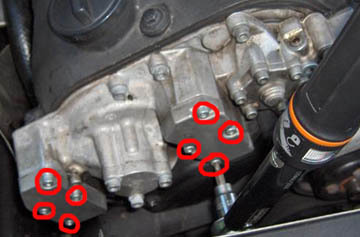 Identify the eight bolts that hold on the exhaust and inlet side solenoid covers, as shown in the image middle right. You’ll probably need to remove the fan (32mm spanner – inverse thread) and cowling to gain proper access. Then, remove the vanos filter screw, position shown in the image bottom right. Mop up any excess oil, and fit new screw and washer, tightening to 12Nm. It should be noted that in my car’s case, these bolts failed after 83000 miles – despite them being changed by BMW as part of a recall at around 60000 miles. Maybe they weren’t torqued correctly, maybe these bolts can just fail after 23000 miles. Either way, for a few pounds, I hope you can see why I recommend renewing them so often. The Cure is similar to my proposed Inspection II work, but with a bit of solenoid TLC too. Note! 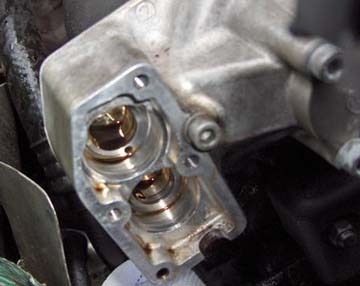 This procedure is my cure for damage to the exhaust solenoids and cover. Remove any remaining complete bolts, the cover, the gasket, and any parts of bolts left in the VANOS. This should expose the rear of the solenoids as shown in the top picture. Using a cloth to protect the rear of the solenoids, and being extremely careful of their fragile wiring, use a pair of pliers to gradually work the solenoids free. Don’t be tempted to use any levers, and don’t expect quick progress, just twist the solenoids to and fro while gently applying force to withdraw them. Once they’re out, remove the two ‘o’ rings, one large and one small, from each solenoid. I used a knife to carefully cut them out. 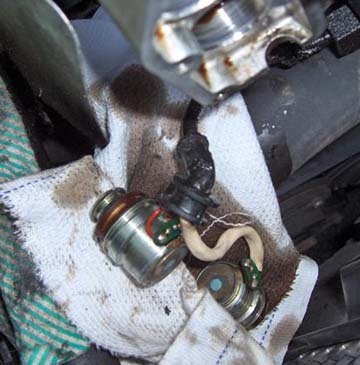 Clean all the oil from solenoids and the open front of the VANOS unit with a clean cloth. Then, coat the four new ‘o’ rings in talcum powder, and fit them to the solenoids. Then refit the solenoids. If you’re unlucky enough to have damaged the solenoids and had to replace them (circa £210), you’ll get a solenoid alignment tool to help you align them. I didn’t, so just tried to put them back exactly as they came out. They should slide home with a rewarding ‘click’. Finally, replace cover with new gasket and bolts, and tighten bolts to 8Nm. Top up engine oil level if necessary. When the engine is first started it’s likely to run rough for a few seconds while oil pressure builds and the VANOS sorts itself out. I hope this article is of use. Please note that it is only advice based on my personal experience. I believe it to be correct to the best of my knowledge, but I’ll accept no responsibility for any damage or losses that may arise as a result of following the instructions in this article. I hope this article prevents people from suffering this nuisance, and helps to dispel some of the myths surrounding the VANOS issues with this engine. Hi, I am about to start on the cure as outlined above. I have not had a failure but my Z3M vanos is rattling a bit. Did the cure above stop the rattling for you ? Hi Jim. The bad news is that this won’t stop the marble-like rattling or growling that comes from within the Vanos unit. That is caused by wear on the gears or timing chain depending on who you believe. This procedure does reduce the likelihood of bolts shearing leading to rapid oil loss leading to engine failure. The good news is that the rattling noise is not related to bolt failure. You may find you can quieten down your Vanos by changing the oil you run. I’ve run 0W40 and 5W40 before and found them quite loud compared with TWS 10W60 which is my preferred oil for this engine. Hi This write up has saved me lots of money and hassle. Can’t thank you enough. Great article. Today I replaced the 8 x bolts and Vanos filter, exactly as per your guide. Thank you!! Quick question, do you know what torque is recommended for the 3 M6 bolts that hold the cover that sits on the right (if you’re facing the vehicle) of the exhaust solenoid cover? P.S. When replacing the solenoid cover bolts, the one’s on the inlet side cover were barely finger tight!! They’re now at a nice 8Nm, but I’ll be keeping an eye on them!! Hi Grant – but you’re pleased you changed those loose bolts! I don’t know what the torque setting for those other three bolts is I’m afraid. I’ll try and find out! Neil, you’re a bloody star! 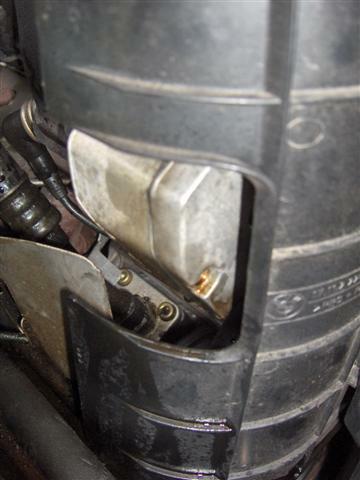 Despite having been fitted with the later bolts,oil was peeing out of the exhaust side solenoid cover. Surprise, surprise, upon following your excellent advise and removing the solenoids,I discovered an outer o’ring broken and both inner ones pretty much shot. Filter change done too now, and all running well. Thanks a lot mate, you’ve saved me a fortune! All the best,Roger. Hi Simon. I believe the rattling noise indicates that the Vanos gear teeth are a little worn. However, I’m not aware that this represents a problem – just that they’re not factory fresh. Certainly the vast majority of Vanos disasters are related to huge oil explosions from sheared bolts, and that seems to happen to both noisey and silent Vanos units. The bolts were replaced under what BMW called a product enhancement change. That’s a muted phrase for a recall. Any BM’s that had main dealer warranty work done should therefore have had the bolts automatically replaced with the better ones. Main dealer can check that on computer. The growl which is loudest at around 1200rpm is the two gears chattering on the splined shaft. They are usually only changed because the sound is niggling to the owner. They can go on for tens of thousands of miles & without affecting the function. My Vanos gears were replaced at 55k miles under extended warranty. The function was OK. I just complained about the noise. Now at 68k miles it growls again ! I just live with it as lonmg as function is not affected. The other problem is hydraulic failure which is rarer & some say can be avoided by ensuring oil temp is up before exceeding 4k RPM. The reason your bolts failed is more than likely because the seals on the solenoids themselves had failed, allowing oil pressure to build up behind the covers. that’s not actually true phil. The covers have a big cutout for the soleniod wires to pass through so the covers arn’t actually sealed. As you say the covers are only a surface for the solenoids to react against, but they aren’t sealed so pressure can’t build up and blow the cover off. Hey Neil. Top info! My ’98 M3 just dumped all it’s oil on the freeway. 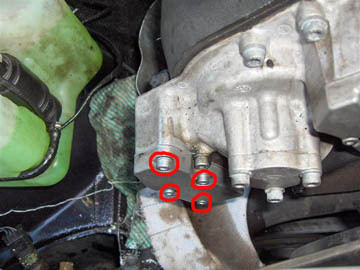 Found the exhaust solenoid cover hanging by one bolt – the other 3 sheared off. Thought it was going to be a new Vanos unit until I found your article. Am now eagerly awaiting delivery of the parts from BMW Australia at a cost of less than $200 – far to expensive for the bits involved but much cheaper than getting BMW to do it. The parts arrived and it took less than a half hour to effect the repair following your instructions. Engine is running fine with no rattles or bangs, so I guess I got it switched off in time when the oil pressure light lit up…..
No worries Ted, I’m really pleased to have been able to help just by sharing my experience. I have just found this site following an oil explosion as a result of the sheared bolts on the solenoid cover. I have spoken to two experts and both say it is due to the seals failing and the solenoid cover becoming presurised – hence shearing the bolts. However, if the bore is not scored I could replace the seals, bolts etc for a lot less – with labour £250. The vanos is a little noisy but not so bad I cant bear it. Has anybody had any experience with refitting the seals and cover and then having repeat problems due to the bore being scored and presumably damaging the seals. Sorry to hear this has happened to you too – the gist of the explanation you’ve been offered makes sense to me. For what it’s worth, I know the car I performed this repair on was still going strong some 25,000 miles later, so in that case at least there was no permanent damage that required a replacement Vanos unit. I am no techie but I’m tempted to have a go at your Cure as above. However,the top left solenoid appears to have pushed out which may have contributed to forcing the cover off. I have taken both solenoids out and fitted them back in but the top one sits a little proud so the cover will not go back on. Ideally the solenoid would slide in a further 5mm but I cant see any obstruction. Is there a technique you can suggest? Also, where did you get your parts from? 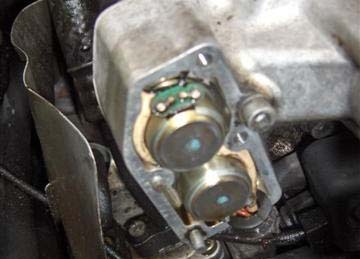 It is usually the seal around that solenoid that fails causing it to pop out and sheer the bolts. Unfortunately I can’t remember exactly what I did now (it was nearly 6 years ago this happened to me!). Is there any movement on the solenoid? Perhaps it is in the fully extended position and it needs to retract. Given it usually fights against massive oil pressure that might be quite hard work – maybe some research into what to apply to the connections to make it move? I opened my vanos unit and I noticed some wear on the solenoids (on the cylindrical face). Is this normal? In my opinion the solenoids should not move. I also noticed some wear on the aluminium cover plate like if the solenoid was tapping against it. I removed the cover gasket and I intend to even put shims between the solenoids and the aluminium cover. What do you think about all this guys? Hope you receive this message and provide me with a bit of advice. I had the same issue happened to me two days ago and mine was a bit worse. As I managed to drive the car for a total of 2km before reaching home and realising all the oil has sprayed all over my engine bay. Thank goodness engine didn’t seize. Anyway problem I have now is that the piece of rubber seal the shape of an elbow surrounding the solenoid wires have cracked. I am looking for a replacement rubber seal. I can only find from BMW that sells the whole solenoid unit but it isn’t cheap. Any chance you would know where to get this rubber seal? Thanks.